Whitfield in a ceremony on June 5, 1999 at Mt. Saint Mary's College receives John DuBois Medal for his Distinguished Public Service. 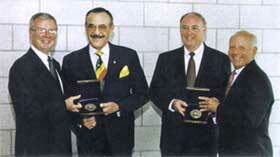 Others shown are President George Houston, left of Whitfield, and, to Whitfield's right, Dan Curtion, Executive Director of the National Catholic Education Association, and Dr. Frank Merolla, Alumni Association President In his 47 years in Africa, Whitfield trained and gave consultation to dozens of athletes who represented their countries as Olympians and All-Africa Games champions. Many such as Kipchoge Keino of Kenya (1500 meters, Mexico City, 1968), MamoWold of Ethiopia (marathon champion and Silver Medalist in 10,000 meter race in Mexico City), 1968, the late John Akii-Bua, of Uganda (400 meter hurdles in 1972 Munich Olympics), and 1980, Ethiopian's Miruts Yifter (10,000 meters and 5,000 meters) won the Moscow Olympic Gold medals in each event. Whitfield also arranged sports scholarships for over 5,000 African athletes to study in the United States. Whitfield is in constant demand as a motivational speaker before business groups, athletes of all sports, and students. He conducted a motivational clinic for the track-and-field athletes and swimmers from South Africa weeks before the Centennial Games. He stressed the mental aspect of winning. "You know how to inspire athletes because you have been where they want to go," says Whitfield. Penny Hayns, the world record holder in the 100 meter breaststroke, was one of the South African swimmers who, listening to him before she competed, won Olympic gold medals in both the 100 and 200 meters. She credited Whitfield with helping her to achieve this feat. Whitfield has been inducted into the National Track and Field Hall of Fame, the Ohio State Sports Hall of Fame, the Olympic Hall of Fame, and the New York Sports Museum Hall of Fame. Introduced into the National Track and Field Hall of Fame, 1992 Whitfield received the Ohio State University Alumni Award, the Los Angeles State University Hall of Fame, Helms World's Trophy, Phi Epsilon Kappa Fraternity, Blue Key National Honor Fraternity, The President's Physical Fitness Program 1955, President's People-to-People Sports Committee, Inc 1954, Los Angeles State University Alumni Sports Association 1956, Ohio State Alumni Sports Association 1946, U.S. Track and Field Coaches Association, a Veteran of Foreign Wars, US Legionnaire, a member of the US Foreign Service Association, and first to promote use of weights training in track events. One of five (5) US Olympians to organize the Southern California Striders, which became the largest and strongest multiracial track-and-field club in the history of the sport. Whitfield is a member of the LA Eastside Business Association, and has Honorary Citizenship to Somali Democratic Republic. Honors, diplomas, awards, citations, certificates are far too many to list in this introduction as sports commentator, author and film producer. A parent of four (4) children, Mal Whitfield's motto is "Make the Impossible Possible, and it is Possible." From the Brandenburg gate to Moscow, Whitfield gave out 5,000 pen pal letters from American children. East German youths, like others, were eager recipients.